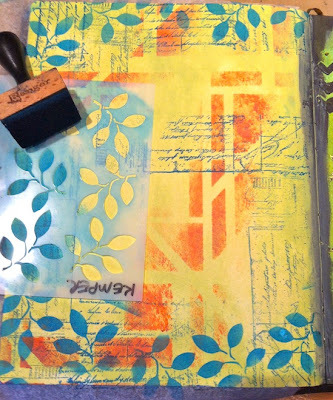 StencilGirl Talk: Experimenting with Leaves and a WINNER! Experimenting with Leaves and a WINNER! I couldn't decide where to go with the tag, so I added more color with MaryBeth Shaw's Web Stencil. 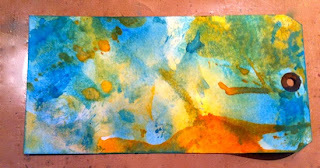 It's one of my favorite stencils for adding random patterns and interest in backgrounds. Out of the tag, I die-cut the Postage Stamp Frame by Tim Holtz/Sizzix. I forgot to take a picture of that, but wanted to mention it since that's what gives the neat edging on the diecut piece. I liked the way the hole reinforcer looked on the leftover piece, so I cut it into a little tag as an accent. Once I moved over to my art journal, I got busy creating a background with paints, stamps, and stencils. 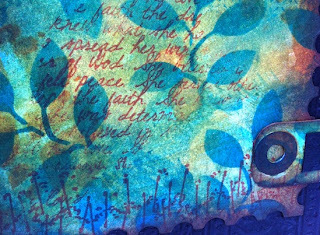 I started with paint through parts of MaryBeth's Rafters Stencil, then added a pale green paint with a baby wipe, more of Teri's leaves, and some script stamping. Here's a peek at that edging. The black mat and the black letters are dry embossed with a Cuttlebug embossing folder. 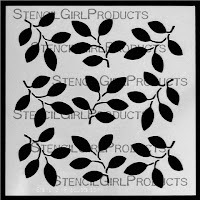 I really like the way Teri's leaves stencil brings the whole thing together, from the background to the focal point. Please visit my website and stay connected by subscribing to my newsletter or YouTube channel. I'm teaching in three different states this month, and I would love to meet any StencilGirl fans in person! Before you leave.......Maria popping in here to announce the WINNER of our Blog Hop Featuring Jamie Fingal's Houses. 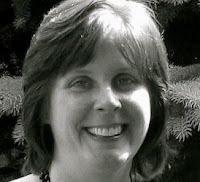 The winner was picked from our Creative Team Member, Corrine Gilman's Blog! Please send me a message on the right sidebar with your mailing information and I will get your stencil out to you! A stunning make Marjie and thanks for the great step by step, love this!! I really like how the leaves look in blue! Great looking projects!!! Wonderful step X step tutorial! Stunning tag, Marjie! Love the process! This is gorgeous and I love the tutorial - thanks for sharing! 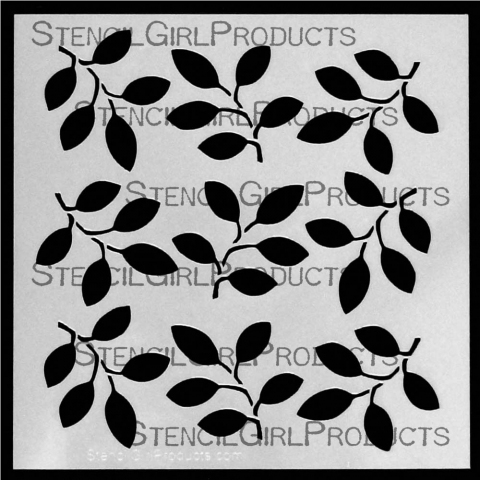 I am really loving this leaf stencil! Great project! Such creative use of stencils, Marjie!! That leaf stencil is going to be versatile, to be sure! Love it for both backgrounds and borders. I just received my first order of stencils from StencilGirl and I am so inspired by what you have done here that tomorrow I will work with mine! Thanks for this great step-by-step tutorial! 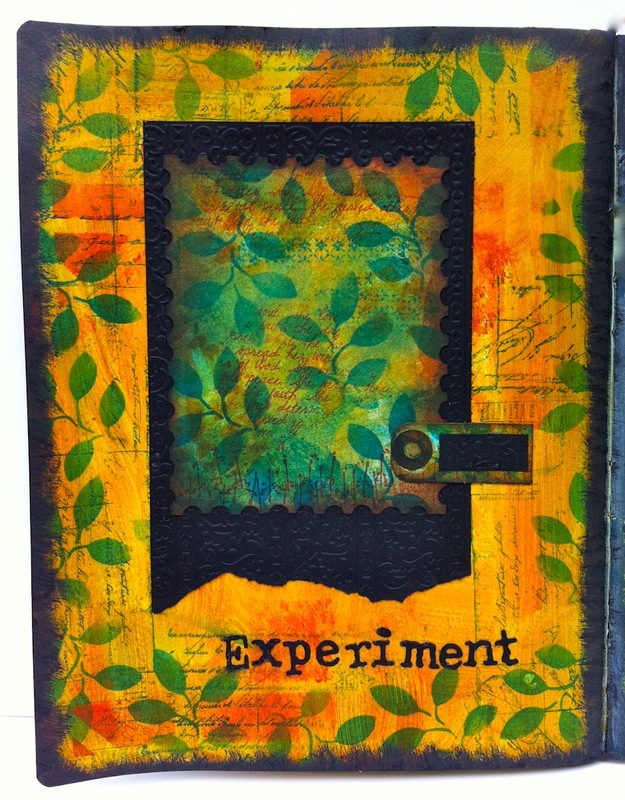 Love the stencils and colors you used. Thanks for sharing. I love these leaves! Wonderful design. Great fun post!